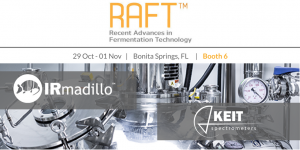 We’ll be demonstrating our rugged FTIR spectrometer at RAFT 2017 on 29 October through 01 November in Bonita Springs, Florida (Booth 6). At our exhibit table, we’ll be monitoring — live — an active fermentation process to allow attendees to see our real-time sensor at work. Also, on Mon., 30th October (12:35-12:45pm) Dan Wood, CEO, will present a brief overview of the innovation of this solid-state FTIR instrument during Monday’s Exhibitor Showcase. Interested in more information? Read the latest Keit application note on monitoring an industrial fermentation process. Can’t make it to RAFT? There are lots of opportunities to connect with us around the globe. Click on our Events tab for an updated list of all the places we’ll be. Follow our updates by connecting with us on LinkedIn, and Twitter. We’ve got lots going on!